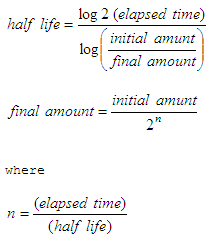 Below we have a half-life calculator. A half-life is the period of time it takes for a substance undergoing decay to decrease by half. Let’s suppose that a well-known substance decomposes in water into chloride and sodium ions according to the law of exponential decay. If the initial amount of the substance is 24 kg and after 10 hours, 14 kg are left, how much substance is left after 1 day? How long does it take until 0.25 kg is left? First, we solve for the half-life; second, we solve for the ending amount; finally, we solve for the time considered in the formulas.